In addition to cruise passengers, college kids on Spring Break and other vacationers, Key West has been a popular destination for U.S. Presidents. William Howard Taft, Franklin Roosevelt, Harry Truman, Dwight Eisenhower, John F. Kennedy, Jimmy Carter and Bill Clinton all have visited Key West. In fact, Key West has its own presidential residence. Known as the “Little White House,” this building was constructed in 1890 as a home for the commandant and the paymaster of the Key West Navy base. However, because of its secure location on a Navy base, the house soon came to the attention of chief executives looking to escape Washington in order to relax in Key West's beautiful climate. Of all the presidents who have visited Key West, President Harry Truman is the most closely associated with Key West and the Little White House. During his administration (1944 to 1952), President Truman visited Key West eleven times and stayed for a total of 175 days. While in Key West, not only did President Truman relax but he conducted the duties of his office from Key West. The Marshall Plan, the formation of the Department of Defense and recognition of the State of Israel were among the topics discussed here. An Executive Order requiring desegregation of federal contractors was issued from Key West. Thus, the Little White House should not be thought of just as a pleasure grounds but as a place where history was made. The Little White House is located very close to the main cruise port in Key West. Indeed, from Pier B, the Little White House is just behind the line of hotels and condominiums that border the cruise port. You just go up to Front Street and turn right. The street soon turns into a pedestrian walkway with a fountain in the middle. Proceed past the fountain and where the pedestrian walkway turns back into a street, the Little White House is on the right side. There is a big sign so you cannot miss it. Bordering the grounds is a low fence with peripheral planting on the other side. Tall trees shade the grassy lawn. The house itself is a low, narrow, rectangular building with a gabled roof. True to its name, this wooden structure is painted white. There are very few visible windows. Most are hidden from view by louvers designed to block out the direct sun while still letting in the breeze. Visitors enter the house through the gift shop, which is on the other side of the house from Front Street. Inside, in addition to shelves of books and presidential souvenirs, there are two exhibit rooms. 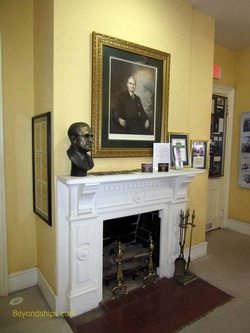 These have a brief history of the house, some paintings done of the house over the years and a display listing some of the major accomplishments of the Truman Administration. Access to the remainder of the house is by guided tour. The tour tickets are sold at the counter in the gift shop. Ticket in hand, you go out a screen door to a covered patio where there are benches and Adirondack chairs to sit while you wait for a guide to appear. In 1974, the Navy closed this section of its base at Key West. The Little White House was allowed to deteriorate, attracting termites and homeless squatters. Eventually, the property was sold to a private developer who developed some of the surrounding area as hotels and private residences. However, the Little White House was then donated to the State of Florida as a presidential historical site in 1987. In 1990, approximately $1 million was spent restoring the Little White House. Although the site is owned by the State of Florida, the Little White House receives no funding from the State. Instead, the cost of operating and maintaining the site is covered by the ticket and gift sales as well as private contributions. The Little White House is still maintained as a presidential location. In other words, the current president and/or former presidents can come to stay. Also, the U.S. Departments of State and Defense use the house for dinners and diplomatic missions. Therefore, the U.S. Secret Service prohibits any kind of photography or video during the tour. Inside, the house has been restored to how it looked when President Truman was in office. The décor and furnishings reflect upper middle class tastes of the late 1940s. The walls are conservative pale colors - - blues, greens, grays - - with white trim. The chairs and sofas are over-stuffed and cloth-covered except for a few that have bamboo arms and legs - - a nod to the tropics. Dark wood tables, sideboards, desks and cabinets complete the scene. The furniture and decoration is authentic. When the house was closed the Navy cataloged and stored the contents. Upon the restoration of the Little White House, these items were returned to their former location. As a result, you see President Truman's piano, his record player, and various other personal items. One of the most memorable items is a large poker table. This table was made at the Navy base for the President. It is carved out of mahogany and has built-in ash trays, which were once shell casings for naval guns. President Truman would play poker with his staff, cabinet members and other government officials as a way to relax at the end of the day. Although the stakes were only a few dollars, Mrs. Truman disapproved of this form of relaxation. Therefore, a wooden top was made, which could be placed over the poker chips and ash trays, so as to disguise the table from the First Lady. In the same room is a bar built into one of the walls. President Truman would begin each day with a “heart-starter” - - Old Grandad bourbon chased with a large glass of Florida orange juice. When asked, the President claimed that his doctor had prescribed this regime. The tour takes you through the living room, the dining room and the poker table room on the lower floor. Upstairs you see the bedrooms used by President and Mrs. Truman as well as an enclosed porch. There is an additional suite but that is off limits to visitors as it is the bedroom used by visiting Presidents. Going through the house is interesting on two levels. First, it is interesting to see a house that has been authentically restored to the late 1940s. Although that period is still within living memory, the extent of the change in tastes between that period and today is significant. Moreover, such décor is emerging from being regarded as old fashioned and out of date into being appreciated as a recognizable coherent style. Second, a visit is interesting because you get a sense of the person who lived here. As the guide speaks, President Truman steps from being a figure in the history books to being a real person. 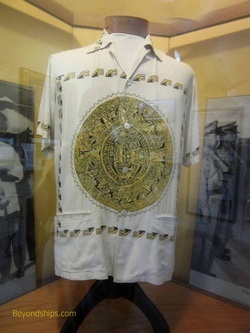 You can see him relaxing in the loud tropical shirts that were his “Key West uniform.” You can imagine him listening to his daughter's singing debut over the radio in the living room. On the grounds, you can picture him holding meetings with his cabinet and the White House staff. I also came away with a much better appreciation of President Truman's achievements. Both the guide's talk and the exhibit area listed significant accomplishments in the areas of civil rights, defense, international organizations, and world peace. Some of his decisions may be controversial but his record is nonetheless impressive. The Little White House is open daily from 9 a.m. to 5 p.m. with the last tour leaving at 4:30.